This roller coaster is themed as an Old West mine train and takes riders through desert canyons and an old mining town with several other diversions along the way. 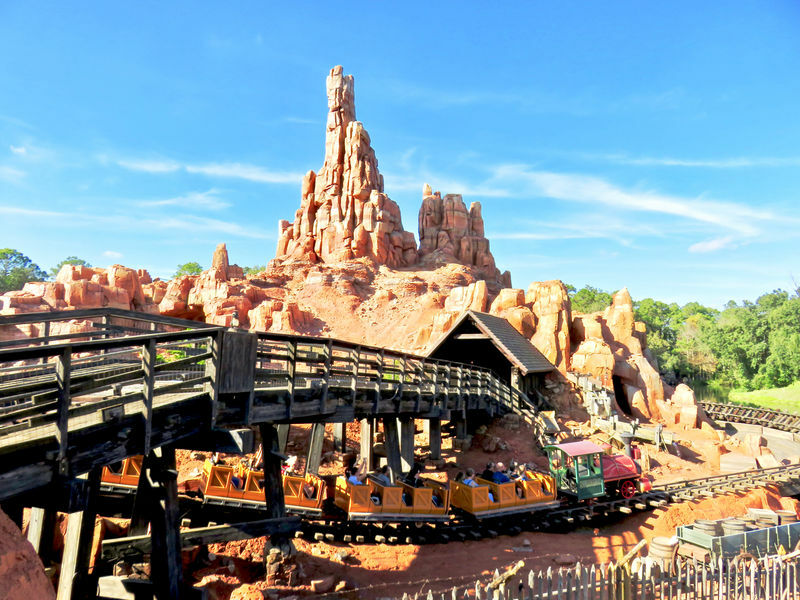 While pretty mild compared to the extreme standards of modern roller coasters, Big Thunder Mountain Railroad provides enough twists, turns, and rolls in a to continue to be a very popular ride. For those leery of coasters, there are no loops or serious drops. Location: Left side of Rivers of America, beyond Splash Mountain. # of Ride Units: Six trains exist, up to five can be running simultaneously. Ride Capacity: Each train pulls five passenger cars, each passenger car can hold six people. Wait Times: On the busiest days, wait times can extend beyond an hour. Using FastPass is strongly recommended if the wait is long. Queue Description: The queue theming matches the overall theming, appearing to wind through a canyon in Utah's Monument Valley (Disneyland's version of the ride is inspired by Utah's Bryce Canyon). The queue has significant slopes and stairs. Health Restriction: While not the wildest in the world, this is a roller coaster with sudden turns and increased g-forces. Riders with known health problems (particularly heart, blood pressure, back or neck, or susceptibility to motion sickness) should not ride. Pregnant women should also pass on riding. Ride Access: The queue is not accessible to users of wheelchairs or ECVs. 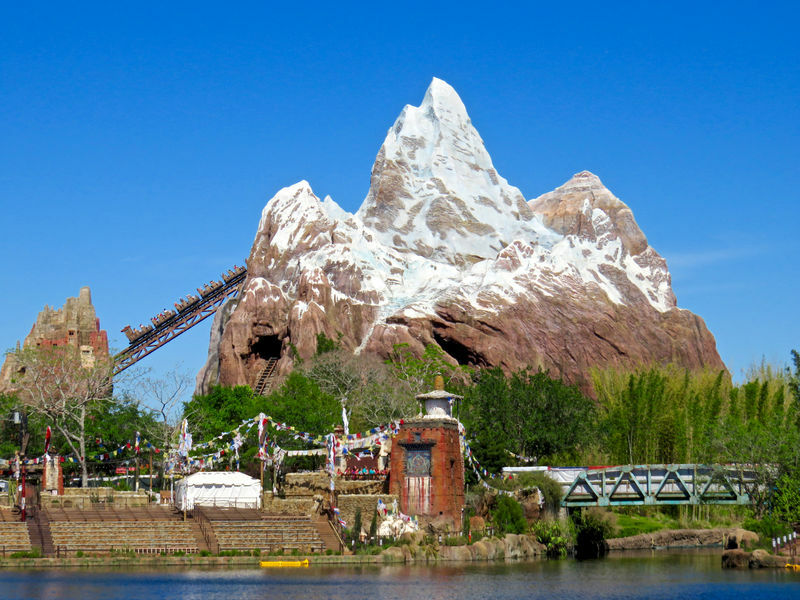 Guests unable to walk slopes or climb stairs would also have difficulty with the queue. Wheelchair and ECV users should enter through the attractions exit and speak to a cast member at the loading station. Wheelchair Transfer: Transferring from a wheelchair or ECV into the train is required. Your wheelchair or ECV will be moved to the exit side of the track while you are riding. Audio: There is no audio on this attraction. Weight and Size Issues: Leg room can be a bit cramped for tall riders. The lapbar has a sufficient range to accommodate riders of just about all sizes, though riding alone in a row may be more comfortable. 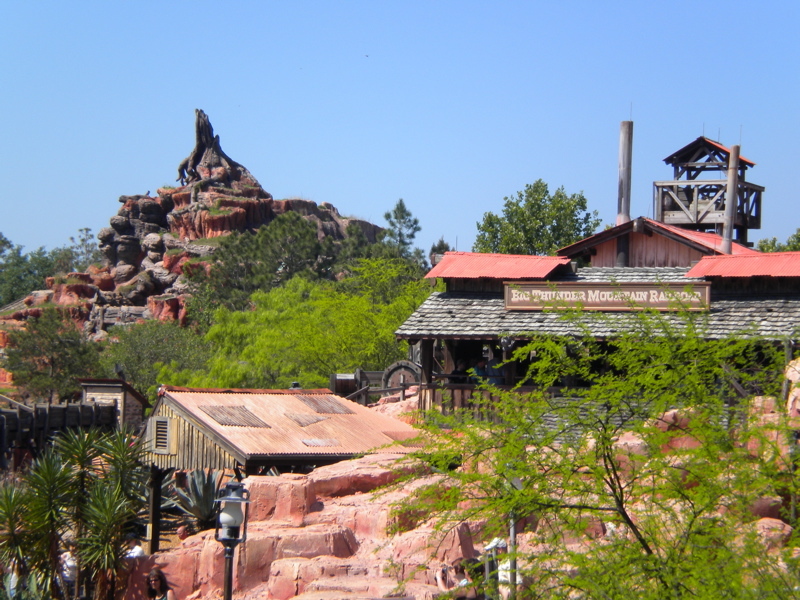 At this location: Big Thunder Mountain Railroad is the only attraction to have existed in this location. The area was unused prior to the attraction's opening in 1980. The Attraction's History: Big Thunder Mountain Railroad hasn't changed much since it opened in 1980, but it sure had plenty of history by the time it was built. Because it was thought that Walt Disney World was too close to real piriate attractions and New Orleans Square, it was quickly decided that the Magic Kingdom would not have neither New Orleans Square nor Pirates of the Caribbean, perhaps the most popular attraction at Disneyland. Instead, imagineer Marc Davis was assigned the task of developing a new marquee attraction for Walt Disney World. Western River Expedition wsa the resulting design and it included an area called Big Thunder Mesa, on top of which would be a mine car ride. That mine car ride wasn't quite what became Big Thunder Mountain Railroad, but it provided the seed. Imagineer Tony Baxter was given the assignment of fleshing out this portion of the area, but two issues eventually derailed Western River Expedition. The Magic Kingdom opened in 1971 and guests demanded Pirates of the Caribbean, which was quickly fastracked and opened in 1973. This took the wind out of Western River Expeditions sails and the project began to founder, a situation only made worse by a bad economic spell in the mid-1970s. During this time, Tony Baxter's mine-car roller coaster began to develop as a standalone attraction and it was eventually approved for both Disneyland and Magic Kingdom's Frontierlands. The Disneyland version opened first in 1979 even though it grew out of a project originally intended for Walt Disney World. Just a bit short: The highest point on Big Thunder Mountain Railroad is 197.5 feet tall, just shy of Cinderella Castle's 198 feet, allowing it to remain the tallest structure at Magic Kingdom. Train names: Though only five can run at a time, there are six trains available. Their names are: I.B. Hearty, I.M. Brave, I.M. Fearless, U.B. Bold, U.R. Courageous, and U.R. Daring.